It’s all out war as the various races of Mars have had enough. Resources are low, the planet is losing its atmosphere, and tensions are high. 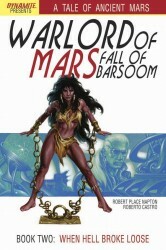 Dynamite Entertainment’s second issue of Warlord of Mars: Fall of Barsoom has arrived, and you can check out our review after the jump. 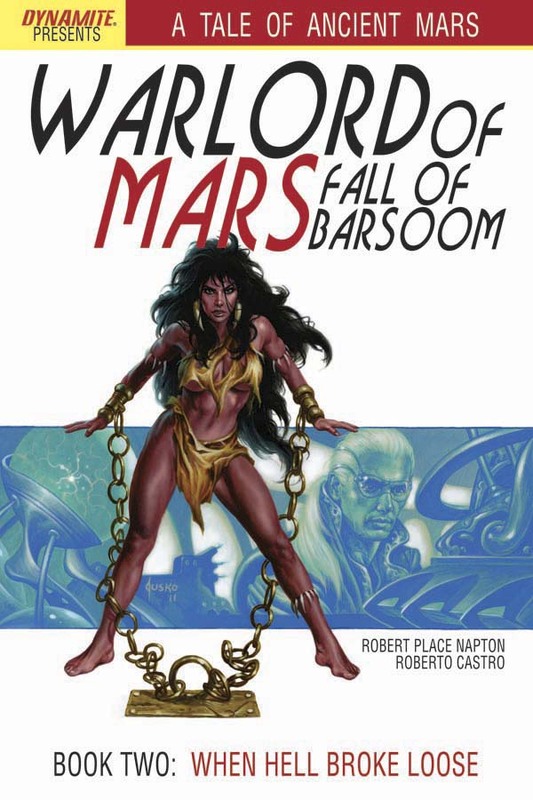 Previously in Warlord of Mars: Fall of Barsoom: Tak Nan Lee is the lead scientist for the planet’s atmosphere project – the only thing that will save the inhabitants. The only problem is they’re all trying to kill each other as things start to spiral out of control. On his way to the factory to begin another test run, he spies a band of Red Martians and Green Martians battling one another, and just so happens to save a scantily clad Red Martian in the process. Things don’t look good for the atmosphere station, every test the scientists have run has resulted in failure. If they can’t get the station operational soon, it’s all over. 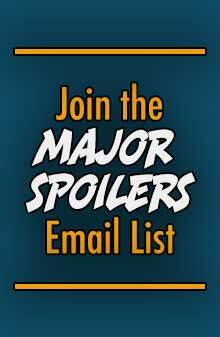 On the plus side, readers do learn that the Red Martian woman Tak rescued last issue is not a young Deja Thoris, but Anouk, who thinks running around in a skimpy bikini is more than enough clothing for anyone. While the two get to know one another, the drums of war are beating as Green Martians and White Martians battle it out. A great deal of the issue focuses on the battle, which while it looks visually stunning, kind of hurts the issue overall. 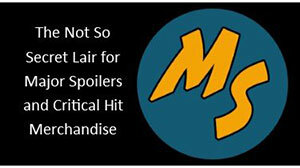 The slaughter on the plains of the planet gives little time for character development, and save for the fact that the Jedak are willing to let one another dies to save themselves, the issue kind of spins its wheels. On the plus side, the art isn’t bad at all. Anouk looks beautiful, and because she’s the only female in the series we’ve seen so far, I can forgive the panels where she is obviously posed to reveal her figure. When it comes to the 12 pages of nearly dialogue free battle action, Castro delivers an epic fight worthy of the big screen. The use of wide panels makes this feel like a Spaghetti Western, and I like it. In fact, I like the art better than the story. While I don’t mind epic battles in the books I read, I do prefer that those battles bring a sense of urgency and a sense of fear for the central characters. I’m not feeling that with this issue. There were a couple of good beats in the book, and the art really works, but overall I thought this issue was just so-so. 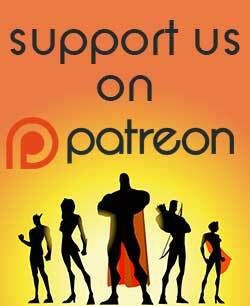 If you are a fan of the Edgar Rice Burroughs world, you might want to pick this up to complete your collection, but for now I’m giving the issue 2 out of 5 Stars.